Steven McComas, Elder, from Hatboro: Lehman Memorial to Pipersville: Rolling Hills as Retired Supply. The Easter PA Conference's Health and Healing Council needs just a few minutes of your time. They have designed a short, simple survey questionnaire about health needs and ministries for lay and clergy members to complete by Feb. 22. You can either complete this Wellness Survey online using their Survey Monkey questionnaire , or go to the Conference Webpage to download, print, fill out and mail in the survey form to Nancy Kraft, RN, 34 Kraft Lane, Schuylkill Haven PA 17972. 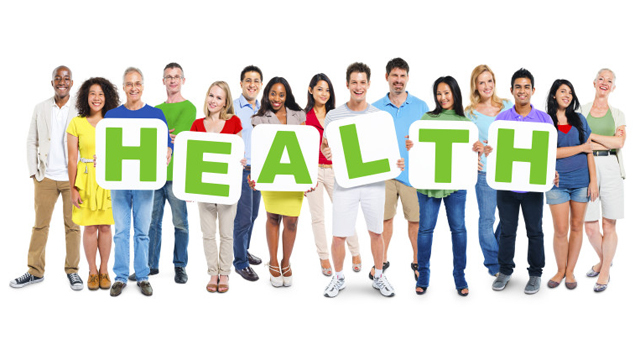 Your answers can help promote health, healing, and wellness in our churches and communities. The Philadelphia interfaith social justice coalition POWER (Philadelphians Organized to Witness, Empower & Rebuild) will inaugurate a suburban wing known as POWER Metro this Sunday, Feb. 21. The "founding convention" will happen from 3 to 5 PM at Trinity Lutheran Church, 1000 Main St., Lansdale. Leaders from many houses of worship, including churches, mosques and synagogues, will gather as one non-partisan voice for socio-economic change in their communities. The deadline has been extended to March 1 to receive urgently needed nominations for leaders to serve on annual conference boards, councils and committees. The conference's Nominating Committee must find the best leadership to serve this conference for the next four years. They will accept Interest Forms from laity and clergy in every district who are interested in serving. Nominees who accept will be voted on for the next quadrennium by the 2016 Annual Conference and will begin their four-year terms of service July 1. Visit the Nominations Committee Webpage for more information, the Nomination Form, and descriptions of the various committees, etc. Nominations may also be submitted online . Hopewell UMC's Man to Man Ministries presents breakfast with Aaron Beam, a former health industry top executive who was jailed because of illegal business practices but now speaks and writes about ethics, on Saturday, March 19, 8:30 AM. Beam will speak at Hopewell UMC, 852 Hopewell Road Downingtown, on "Why it is so hard to do the right thing!" The topic addresses the issue of ethics and the things that can hinder one from following them. Register online for this free event at www.hopewellumc.org/mens-ministry . View the flyer and a video . Our four conference-owned Camp & Retreat Centers are accepting registrations for Summer Camp 2016, as well as applications for staff and volunteers. The 2016 theme is God's Love without Boundaries . But we've still got plenty of excitement happening during these winter and spring months. From n ow through May, our camps are hosting: Pocono Plateau's Confirmation Class this weekend and its upcoming Music Camp; Innabah's 5K Trail Run and Easter Egg Hunt; Gretna Glen's Winter and Spring Blast retreats and annual Mud Run; and Carson-Simpson Farm Christian Camp's Disciple training for young leaders. And there are more retreats galore: for boys and dads, moms and daughters, youth, young adults, even women with creative hearts in need of renewal, and much more. Look for more information and dates on our Website, and visit the individual Camp & Retreat Center's Websites too. Meanwhile, Gretna Glen will try something new the weekend of March 11-13: an intentional Diversity Retreat to help UM youth in grades 8 to 12 develop cross-racial, cross-cultural encounters while building "beloved community." They'll explore their unique backgrounds and common interests while enjoying fun activities, group fellowship, diverse worship experiences and special foods. The cost for the full weekend including two nights and five meals (from 7 PM Friday to 2 PM Sunday) is $110. Scholarship help is available. Register directly on the Gretna Glen website at gretnaglen.org . Contact Gretna Glen at 717-273-5625 or Carlen Blackstone at blackstonec@verizon.net for more information. Lent is a season of self-reflection and examining your relationship with God. In this resource, "Beyond Fasting: 10 Tips For A More Meaningful Lent," learn different ways of observing Lent that can add more personal meaning beyond simply fasting or giving up something you enjoy. You can serve someone in need, apologize to someone, and visit those in prison or shut-in due to illness. Take your Lenten observance to another level by acknowledging what the Scriptures qualify as true worship and fasting in Isaiah 58 . Also, browse through more Lenten resources, including devotions, sermon starters, and books from Cokesbury, Upper Room, Rethink Church, and Imagine No Malaria. Dr. Nathan Wright, who teaches the Sociology of Religion at Bryn Mawr College. To learn more visit the Facebook page for this event. One Great Hour of Sharing (OGHS) happens Sunday, March 6 . 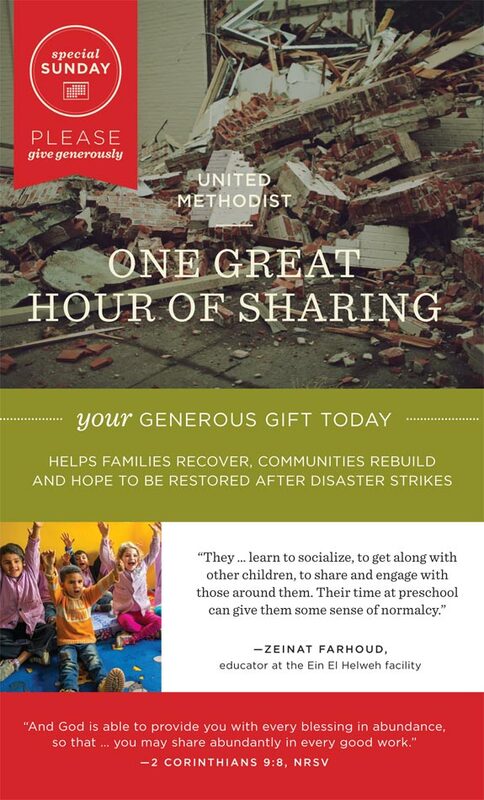 This Special Sunday with offering enables the United Methodist Committee on Relief (UMCOR) alleviate human suffering and respond to natural or human-caused disasters across the U.S. and around the world. Your gifts make it possible for UMCOR to use 100 percent of donors' gifts for the projects they specify, instead of administration or fundraising. UMCOR does not receive World Service or apportionment funds; so without your offerings, UMCOR would not exist. 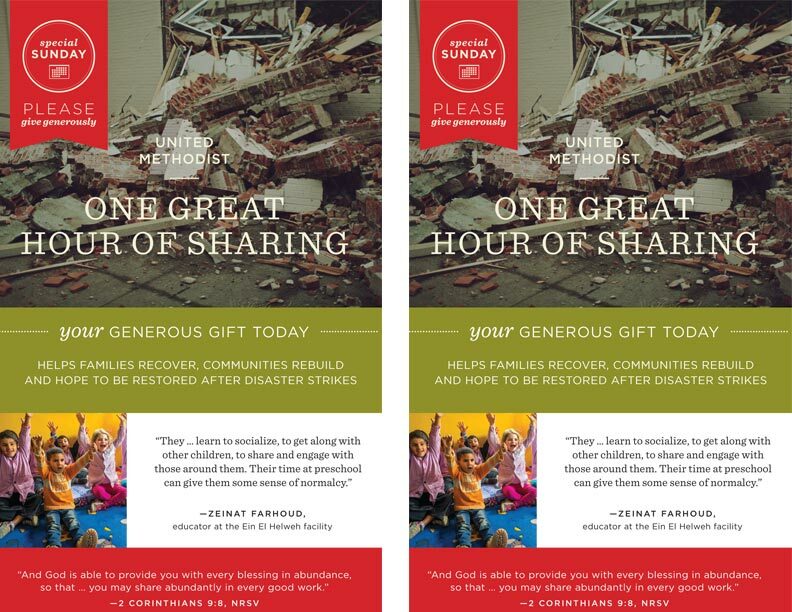 Download and share the OGHS church bulletin , poster , the Pastor and Leader's Kit , and the e-book, " How to Promote One Great Hour of Sharing in Your Congregation." The Fellowship Of Associate Members And Local Pastors will hold their annual retreat April 24-26, at Black Rock Retreat Center, 1345 Kirkwood Pike, Quarryville, PA. Associate Members, Local Pastors, Student Pastors and Certified Lay Ministers of both the Eastern PA and Peninsula-Delaware conferences are encouraged to attend and to register online now . The $275 price includes 2 nights, 5 meals and 2.0 CEUs. For more information contact Mark Beiderman at 610-585-0575. Download the brochure for a registration form. The keynote speaker is the Rev. Dr. Charles Yrigoyen Jr., of Lancaster County, the author or editor of 16 books, mostly on Methodism and its founders, the Wesleys. A clergy member of the Eastern PA Conference since 1960, Chuck has academic degrees from the Wharton School of Business, several local seminaries and Temple University, where he earned a Ph.D. He has served churches in Lancaster County and Philadelphia, was Chaplain and Professor of Religion at Albright College, and led the UMC's General Commission on Archives and History as General Secretary for 24 years. The longtime editor of Methodist History, the denomination's historical journal, he was taught church history at Drew University's Theological and Graduate schools and has also taught at five other area theological seminaries. He presently teaches in the Course of Study program for Wesley Seminary. The Peninsula-Delaware Conference Disaster Response Committee will offer a spring training in Early Response Team (ERT) work for new trainees and others needing recertification. Interested Eastern PA Conference members are invited to attend the training Saturday, April 30, 8 AM to 5 PM, at Whatcoat UMC, Dover, Del. Clergy CEUs are available. Download the information flyer and registration form [PDF]. Although not first-responders, ERTs do respond early to disasters, going in to clear, clean and secure damaged homes and to provide other aid to survivors, along with a caring presence, but not to repair or rebuild structures. ERTs work in coordination with Volunteers In Mission (UMVIM). Read "Seven 'Fast Facts' about UMCOR Training" now to learn more . Gifts to UMCOR U.S. Disaster Response, Advance #901670 , support these training programs, as well as aid in disaster recovery.